Miami’s Cubans dominate many facets of the local political economy. Los cubanos en Miami-Dade. Data Source: 2010 Decennial Census. Map Source: Matthew Toro. 2014. Amongst the Cuban community in Miami, there’s nearly universal antipathy toward the Castro brothers, especially the elder. Due to illness, and recognizing his inability to successfully maintain his quasi-autocratic rule over Cuba, Fidel transferred power to his younger brother, Raúl, in 2006. In total, the Castro brothers have maintained a grip on the island — geopolitically critical due to its proximity to the United States — for over five decades. For most Miami Cubans, despite the more than half century that has passed since the Cuban Revolution, painful memories of family and friends killed, property and assets seized, and the overarching perception of a motherland lost to an ideologically-unacceptable fate fuels a persistent animosity toward the communist regime on the island. Nonetheless, recent evidence suggests that younger generations of Cuban-Americans are increasingly likely to be in favor of more amicable US-Cuba relations. It will be quite some time, however, before the Cuban exile attitude toward the Cuban regime is overwhelmingly positive. Until then, the populist sentiment will remain one of unapologetic spitefulness, where the thought of a dead Castro is welcomed, and even displayed openly as public humor. Populist Cuban Propaganda. 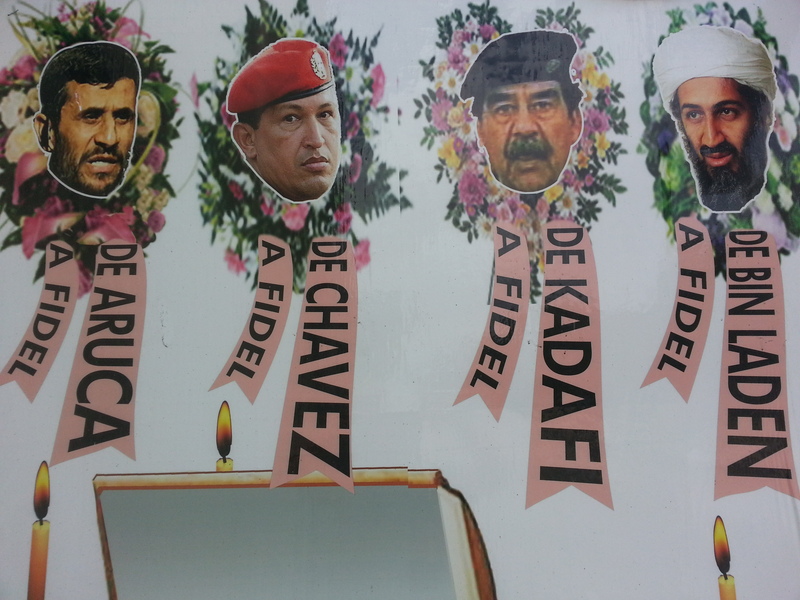 Note that Mahmoud Ahmadinejad’s face doesn’t match the name “Aruca” (for Franciso Aruca), nor does Saddam Hussein’s match the name “Kadefi” (for Muammar Gaddafi). It seems that disliked public figures can be alternated on this particular sign. Source: Matthew Toro. May 10, 2014. Here’s the Miami Geo Quiz for today, Miami. Miami Geo Quiz #13: Look at the photographs above and below. They depict a sign one can find somewhere in Miami. There’s a short, derogatory epithet written on this sign, just below Fidel’s casket. Provide the full text one can find below Fidel’s casket and translate it into English. Additional Clue #1 (Friday, July 25): The poster can be found along the road that divides the street grid into North and South. Miami Geo Quiz #13: Cuban Exiles Killing Castro. Source: Matthew Toro. May 10, 2014. Remember, winners of Miami Geo Quizzes now receive prizes. See prize details at the main Miami Geo Quiz page. You got it, LomoSaltado! Awesome work! You’ll be receiving the Miami Geo Quiz Coffee Prize. We’ll be contacting you with details! Be on the lookout for Miami Geo Quiz #14, everybody; coming soon! premitive1: You’re right: Flagler Street is, is fact, the road that divides the grid into North and South; and it is indeed a long one! LomoSaltado: It sounds very plausible. 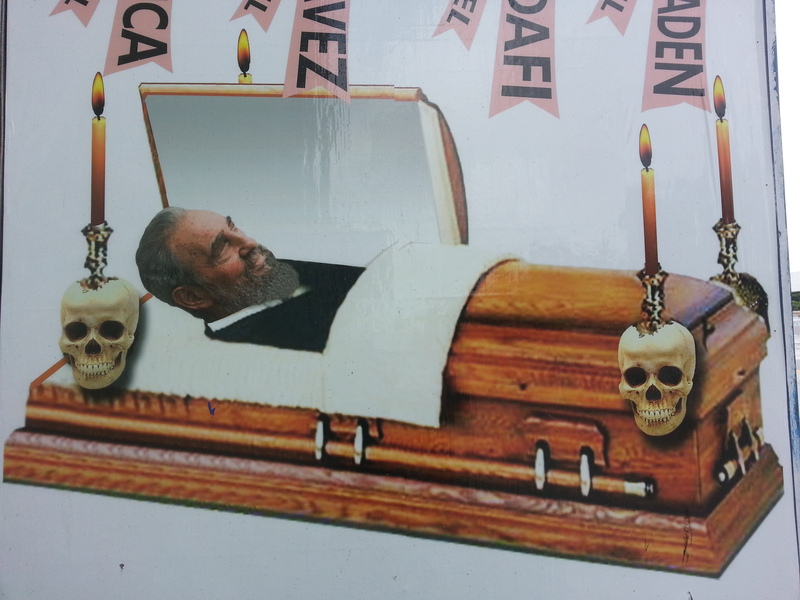 However, there’s a short, derogatory epithet written on this sign, just below Fidel’s casket. In order to seal the deal and win the prize, one must provide the full text found below Fidel’s casket and translate it into English. The Devil came to pick me up. W Flagler and 55th Ave? Garcia Signs across from the GFS Superstore?